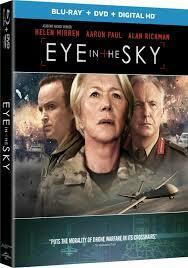 Eye in the Sky is a new war drama-thriller that plays like an old-fashioned military mission movie save for its wholly modern take on the moral, bureaucratic, political and personal implications of drone warfare. 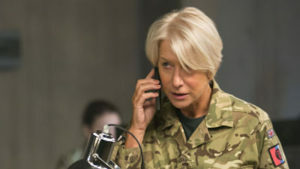 The film follows Colonel Katherine Powell (a tough-as-nails Helen Mirren), a UK-based military officer in command of a secret drone operation to capture terrorists in Kenya. Using remote surveillance and on-the-ground intelligence, Powell discovers the targets are planning a suicide bombing and the mission escalates from “capture” to “kill.” Powell and her team’s plan to have an American drone pilot Steve Watts (Aaron Paul, TV’s Breaking Bad) launch on the enemy are abruptly halted when a nine-year-old girl enters the kill zone, triggering an international dispute over whether to attack or not, a disagreement that reaches the highest levels of the American and British governments. Directed by Gavin Hood (Ender’s Game), Eye in the Sky features muscular performances by the entire cast, which also include Alan Rickman (A Little Chaos), in his final screen appearance before his death last fall. And Paul once again demonstrates his strengths as the go-to actor for delivering a jittery man-on-the-edge performance. There are two bonus featurettes that run about two minutes each that are more-or-less EPK promotional pieces.